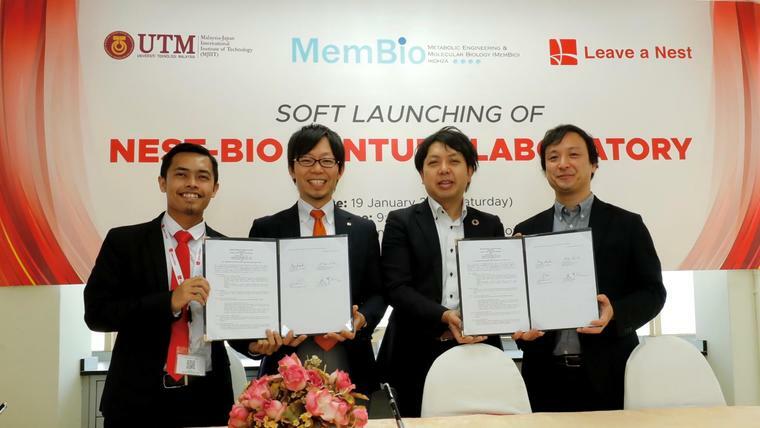 Metabologenomics, Inc. (CEO Dr. Fukuda, Yamagata, Japan) is providing its first international research base in Nest-Bio Venture Lab, a joint laboratory establishes by Leave a Nest Malaysia Sdn. Bhd. which is the second subsidiary company outside Japan for Leave a Nest Co., Ltd. (Group CEO Dr. Maru, Tokyo, Japan, hereafter LVNS) and Malaysia-Japan International Institute of Technology (MJIIT), Universiti Teknologi Malaysia (UTM)（hereafter MJIIT, UTM), planning to start intestinal environment research in Southeast Asia. "Nest Bio Venture Lab" is a joint laboratory which Leave a Nest Malaysia Sdn. Bhd. and MJIIT, UTM established with MEMO-Bio (Metabolic Engineering & Molecular Biology), a research group that specializes in genetic engineering and waste utilization at MJIIT, UTM on January 19th, 2019 to contribute to the growth of bio research and industry in Malaysia. In this occasion, Metabologenomics signed up as one of the premier international partners with euglena Co., Ltd. and LVNS to foster partnership between parties to support establishment of joint laboratory at MJIIT and to start intestinal environment research. Recent research has revealed that human health is closely related to the intestinal environment and it differs between individuals mainly depending on long-term dietary habit. Metabologenomics has analyzed many people's intestinal environment based on scientific evidence through our proprietary frontier technology, but the target of our research is 7.5 billion world all mankind. As the first step to expand our research, we are starting intestinal environment research targeting people in Malaysia and Islamic. Dietary culture in Islamic especially for halal has been paid attention. However, intestinal environment on those people has not been revealed. We are expecting to discover fundamental gut microbiota in halal, while Japanese people's dietary habit has been westernized. We are promoting intestinal environment research in Nest Bio Venture Lab collaborating with local universities and companies considering local traditional dietary cultures. We are expecting to obtain new findings especially about the relationship between intestinal environment data and dietary habit, lifestyle for halal, health, and disease through the research in Nest Bio Venture Lab. We aim to build the database of intestinal environment of people all over the world to protect their health, and in the near future, to develop our original intestinal environment analysis service in the world.